Shop-n-Spree: Shopping Paradise is rated 3.6 out of 5 by 59. Rated 5 out of 5 by marler from Great game Great game! Already finished the game several times and started playing again. Just like the two previous games,it has everything i like in a game. Love the gameplay and the challenges. Rated 5 out of 5 by JibbyEllison from Shop-n-Spree: Shopping Paradise??? 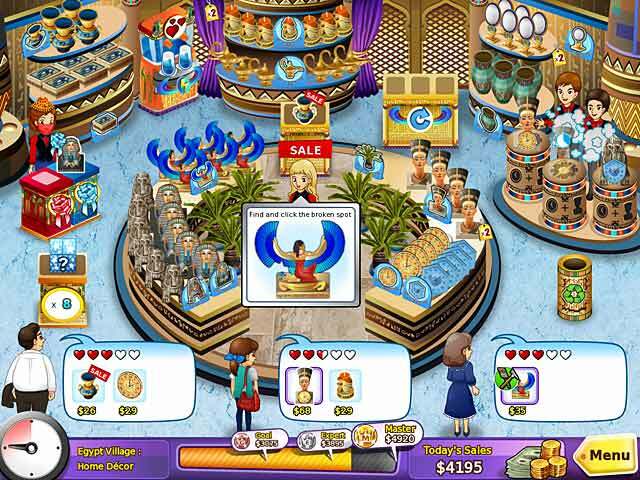 Shop-n-Spree: Shopping Paradise is a game where you have to get enough money to make more shops and more malls. To get that money, you will get customers coming into your many shops and you will have to give them what they want. Sometimes they just want one thing, but most of the time they want their item to be excelled, which could mean that they want it gift wrapped, or tassels on it, or it upgraded, etc. The shops you have are wide range, which means that some are food stores, some fashion some home decor some chinese new year, some sports, ect. This game could be boring to some but i found it addictive and i wanted to get all the stores before the game ended, i had to buy this game in the end because all day i was thinking about what other stores could be in line for me! There isnt really any music but when you give the customers what they want, they speak, which does get annoying but and after a while you get used to it! I would recommened this game to 9-15 year old boys and girls as this game is a bit simple and some people would get bored of it! Rated 5 out of 5 by rydalgal from Shop-n-Spree: Shopping Paradise Simple: LOVED it! Slightly different concept to the other 'shop n spree' games but still very enjoyable! Rated 5 out of 5 by cindellou from Buy it I loved it, it lasted long and was fun. Rated 5 out of 5 by SolarEclipse from My Favorite One!!! For me, this is by far my favorite and I think the BEST "Shopping Spree" of them all. This one is so much fun. I love all of the new changes like the assembly station, gift wrap, and the ability to upgrade stations. I'm glad to see other characters involved in each location other than just the customers. It's nice to have a few cheerful employees. I'm glad that the developers freshened this one up just enough to make it a little more interesting. It's still has the same basic game mechanics and mini games like the others, but with a few additions. I've played the other two and I think this one actually developed whole "Shopping Spree" concept the best. I would try the demo. But I just absolutely LOVE this one!!! Rated 5 out of 5 by primrose_11 from Love this game.... Great game. It is a challenge to get master on every level but not impossible. Very addictive! Rated 5 out of 5 by sdiiro from This Is The Sorta Of The Best Game The Best Ever I Really Recomed It. Rated 5 out of 5 by tailswhiskers from Fun game This is a very fun game. The graphics and sound are real good. The instructions are very clear to understand on how to play the game. The object is to build different malls. I was stuck on building the dragons. The time flew by and before I knew it the demo was over. I would recommend this game for both kids and adults. Rated 5 out of 5 by Tiger2010 from The best one yet This is the third instalment of the Shop-N-Spree games that is part Time Management and part colourful, fun HOG. This time you're on an island and create different malls with a variety of items from around the world. The only downside, for me, is that the scenes can get a little busy with all the colour, but once you get used to where everything is, it's a fun and quite easy game to play. Perfect for whiling away a few hours with the feel good factor. No dark and eerie in this one. Rated 5 out of 5 by biblereader1611 from If you liked the first you'll like this one This is a good game with some interesting twists to keep you moving quick with add ons, wrapping, assembly, etc. Always wondering what new stores will pop up and with about 5 malls -- always something new. Thanks for the right click short cuts! Was waiting for a better TM game and this one is it. I like that you can pick where to go during the levels, and that the upgrades don't always "recommend" your choice...that gets boring. Anyway, I like this one--finally! Only problems are clicking vs dragging as the game uses both and sometimes the clicks are less accurate than I like...good thing there's a sales table. Rated 5 out of 5 by allnurses123 from Another Hit I love the Shop-n-Spree games. This newest version did not disappoint. The mini games are a little difficult, and initially, the instructions confused me. BUT.....I have been playing the game now for about an hour..and I just love it. I didn't even wait to play my hour's free time. After about 10 minutes, I knew I wanted to buy it. Rated 5 out of 5 by mammamia21099 from Loved It! Great sequel in the Shop n Spree Series! I just loved this game! I have enjoyed each of the Shop n Spree games, and this is no exception. The premise of this game is that the Island that is your home is almost completely Bankrupt. To save the Island, and bring the tourists back, they decided to turn it into a shopping Island. You start out with one store, and have to turn it into a mall by adding departments. I thought the mini games in this one were much harder than the last two games, you really have to pay attention to win them. The sound was great, the music fun, and the graphics were terrific! Overall, a wonderful game for all TM lovers! Enjoy. Rated 5 out of 5 by Imberis from Shop n' Spree: Weeeee! Here's my review of the demo, although I already bought the game. All in all, a great game if you enjoy time mangament games, and even if you don't, it's also sort of like a hog game, a la Gardenscapes. Your job is to clean and restock your store and fill customers' orders in a timely fashion. Pros: +The story is mildly interesting this time around, and I thought the multi-cultural aspect was kind of sweet (we'll see how it pans out later). + The graphics are nice and bright. +There are two modes of gameplay, timed and untimed! Nice addition there. (I played in timed mode, so I'm not sure how the customers will react, i.e. if they'll still pitch a fit if you deliver your items too slowly.) +There are many ways of picking up items. #1: standard pick 'em up, place 'em down. #2: drag the item to the customer #3: pick up up to four items at one time, to fulfill multiple orders. Very handy! #4: Right click on an item and it will automatically go to a customer. My favorite method is the third. It gets things done much quicker. +Another pro is the way the bonus bar works. I assume it gets harder as you go along, but I got a 53 bonus on my very first level. + I enjoy working to collect the stars needed to open new departments in the mall. (Plus then you get to work with a whole new selection of items.) So far, I don't see any cons. The music is so unobtrusive that I didn't even feel the need to turn it down. Rated 4 out of 5 by Selkie2283 from Seemed Short A fun game, but it felt like it was over pretty fast. Attaining "Master" for each sub-level was challenging, without being frustrating (but even Mastering each level, the game felt short). Rated 4 out of 5 by Tikatoy from "Fast-paced fun" is accurate Picked this up as a DD after having demoed it a long time ago and deciding it wasn't worth full price (but still seemed fun). Gameplay is straightforward: customers request items they want and you click on them to deliver. Sometimes they want things gift-wrapped or assembled (e.g. putting boots on a snowboard). Then you click to pick up the components and click to deliver them to a station where shop employees put everything together, and you deliver the finished product. Every level is like this and they get progressively tougher as customers ask for more products that require assembly. Some customers also only show you the silhouette of the item you want, making it a bit tougher to hunt for the item. There are some simple mini-games (like you'd find in a typical HOG) to break up the standard gameplay, but the bulk of the time you'll be delivering items to customers. It's simple and fun, although not easy if you're trying to get those master (gold) scores. This requires delivering items quickly to customers to build combos. If you take too long to deliver the next item, the combo is broken. Really long combos earn you lots of points. If you want to take a relaxed approach to the game this is also fine. It just means you will earn fewer stars and upgrade hearts so you will need to play more levels in order to unlock the next department store. There is a minimum goal to reach in each store for the region before you can proceed to the next region, but it's really easy to obtain so there's no pressure. Overall a light, fun, addictive game! Rated 4 out of 5 by bethmt from Enjoyable! I've never played the previous Shop-n-Spree game, so can't compare it with that one. But I found this game to be fun and challenging. It's a TM game but, since you need to find products for customers, there's a little hidden object element to it. But more than just giving products to the waiting customers, there are many products that need assembly or preparation. The shops are in different exotic locations, and include products such as food, souvenirs and costumes. There are enough levels to provide hours of game play and at times it's very fast paced. My one complaint was the restocking element, which was kind of slow at first...so I advise upgrading that as soon as possible. Also, some of the items were too close together There were quite a few times I'd accidentally pick up the wrong item, which was frustrating when the game got into the fast-paced stage. But aside from these things, I found the game to be a lot of fun. Rated 4 out of 5 by AnLuk from Good Experiance I like this whole series. They are fun to play,with mini games, and upgrades. It's a bright and colorful game too. I play it with my baby brother, I will give him something to look for and he is getting pretty good at it. I also let him choose which customers to charge more. He gets a kick out of that. I recommend this game to everyone. It's fun,and interesting. I like the part where you build the item you sell. The mini games are easy and you get a bonus for playing them. Shop n Spree is a series I just buy without trying,I just know I'll enjoy playing it. Rated 4 out of 5 by jeni_kay77 from fun time eater Amusing way to waste a few hours. Rated 4 out of 5 by Menu7 from Challenging and fun to play! Shopping spree challenges your memory as to where things are in the store as you serve customers and as you race against the clock. This is a fun HOG to play because it's actually three games in one...a memory game, hidden object, and time management. This is one of my favorite type of games to play. Rated 4 out of 5 by Altmoabit from a little bit annoying I always liked those previous games where you just have to find things that customers want and for this the cartoonish graphics work. I am also glad that they did not just stick with the usual game,instead they try to add a little extra to it However...I find putting bows on fruits just a little bit annoying, while the assembly lines are ok but both in one scene is a little bit too much detailed for me. especially if you have to constantly switch from right to left click if you want to pick it up to put it on the assembly or extras line. The mini games are about the same as before.I like the little extra story and the way that the added on stuff shows on the main screen. The music can get a little too annoying as well, depends on which department you play in. I probably will buy this one because I like to see what other malls and departments are waiting after the 1 hour is up. Rated 4 out of 5 by QueenB261 from Shop-n-Spree During the hour demo, I played both the normal (timed) and casual (untimed) modes of play and had no difficulty in reaching the master level. Although there are mulltiple ways to get the product to the customers, there is only one way to get the items to the wrapping and/or assembly stations. So if you get into the rhythm of "right clicking" and then have to stop and do the "click and grab and drop", it can be quite frustrating. You also get to play mini games to bolster magic boxes and stars. Stars are used to upgrade workers, the stations and buy new malls. The two that I played were a simple puzzle and a fill-in with preformed shapes. The colors are bright and the sound is good (ie music is not annoying). You also get the added bonus of hearing "thank-you"! The play is not as simple as the first impression since you do have to watch out for whether or not to gift-wrap (red or blue) as well as if the item needs to be assembled and then possibly gift-wrapped as well. The venues also change. After playing one, for instance tropical fruit, it is closed for restocking. You then play one of the others. Rated 3 out of 5 by onniebae6 from Not as good as the first 2 Shop-N-Spree's original 2 were so much more fun! I still play these 2 - trying to earn as much money as I can in the time allotted is so much more fun than putting stuff together. PLEEEEASE make a new Shop-N-Spree like the Family Fortune one - it is the best one by far!! Rated 3 out of 5 by catbag8717 from Will Get Tedious, But Fun To Start Off With This game does start out very very fun, but repetitiveness brings down the rating. Good Parts: Very basic contols, simillar to those of Burger Shop Pretty fun to start off with Upgrading was fun OK Parts: Graphics could use a little work. They were cheap. Kind of like playing a game from 2009. The game was a little too easy and needed a bit more 'spice' to make it harder. Bad Parts: Very, very repetitive. No variety at all. Didn't like the minigames very much. Storyline absolutely pathetic. comic-like, more aimed towards little kids #G rated# and no voice-overs. This game is one where I'd be happy to play the free trial and go. My reccomendation is to download the free trial. Rated 3 out of 5 by Peachkins from No hidden object fun in this one I am fairly new to this series. I just discovered it the other day while looking for a new game. Although I don't own any of them (yet), I have played the demos for all three. I can't believe how different this one seems from the first two in the Shop-n-Spree series. The basic premise is the same: you are essentially trying to build a fantastic shopping destination. You open up new stores and new malls by filling customer orders in your stores and earning stars that enable you to build new stores. There are also mini-games to play that also let you earn stars. Can't comment on the sound as I played with it off, but the graphics- just like with the previous two games- are clear and objects are easy to identify. The thing I really disliked about this game is that the hidden object element is pretty much gone. Yes, you have to look for the objects your customer wants, but they are not hard to find as the stores this time are more organized. The emphasis in this game seems to be concentrating on the number of items someone needs as opposed to really needing to search for things. It made a huge difference for me in how much I liked the game, and not in a good way. Although I also like time management games, the change has still made this one that I'll pass on. Rated 3 out of 5 by SilverBranch from I miss the old Shop-n-spree format! I loved the other 2 shopnspree games. This is a new format and a little less appealing to me. It was simply "okay". Rated 3 out of 5 by agurney76 from Eh... it was ok Ok ok ok ok...not as good as Shop-n-spree Family Fortune which I am downloading to play again because I really didn't like Shopping Paradise as much. Rated 3 out of 5 by sabin1 from The 2nd one was the best I adored the first two Shop N Sprees. I play them over and over and over. This one is NOT as much fun. I might not even finish playing it. I liked all the different choices. Someone says they want an object, and you can pick whatever you want. This one is disappointing. 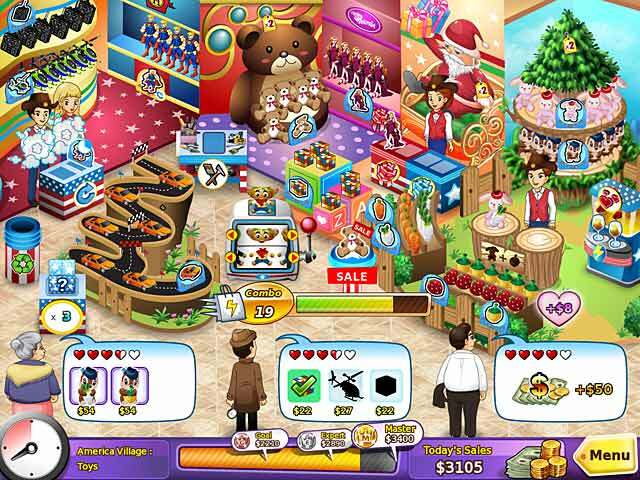 Set a course for fast-paced fun in Shop-n-Spree: Shopping Paradise! Build and run a series of amazing internationally-themed malls in this exciting time-management game!